Arkansas Advanced Initiative for Math and Science, Inc., AR AIMS, an affiliate of the National Math and Science Initiative, exists to strengthen the teaching of the AP® mathematics, science, and English courses and to build enrollment and increase the number of students taking and earning qualifying scores on AP® exams in these subjects. Patsy Williford, the AR AIMS Math Content Director, is retiring this month. 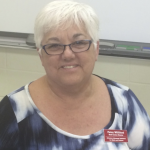 Patsy has been active in the field of mathematics education for 49 years. She taught at Fayetteville High School for 39 years. Patsy also was an adjunct professor at Northwest Arkansas Community College from 2001-2008. She is currently a Laying the Foundation teacher trainer and has been a trainer for College Board Pre-AP Math. From 2009-20015 Patsy was an AR AIMS math consultant. Patsy has been the Math Content director since 2015. We are searching for a Director for Math. The person interested in this position must be one with a vast knowledge of math, have experience in presenting to teachers and administrators, be innovative, and be able to travel. If you are an AP Math teacher or an administrator who has recently taught AP math and are interested in working for AR AIMS to make a difference for teacher effectiveness and student achievement in Arkansas, please contact us. Click to access the job description and additional information. Please note that ALL contents are being offered at Benton and Maumelle. All workshops are $500.00 for teachers from AR AIMS schools, $600.00 for teachers from non AR AIMS schools. ***NOTE: LTF Math & English DO NOT have to be taken in sequential order. This is a tentative agenda that can be printed to submit to administrators for workshop approval . The facts are in! Arkansas AIMS makes THE difference.